Unsteady-state operations of catalytic reactors provide plentiful opportunities for research and commercial realization of efficient heterogeneous catalytic processes. Forced unsteady state conditions generate unique distributions of process parameters and catalyst states often unattainable with traditional, steady-state operation. The unsteady-states can be created by periodic changes in input flow parameters, such as changes in inlet temperature and composition, catalyst circulation through reaction and regeneration zones, or periodic flow reversals through fixed catalyst bed. This can result in increased productivity, selectivity, capital savings and operating cost reduction (higher energy efficiency). Efficient environmental technologies for treatment of toxic emissions, acid rain and greenhouse gas emissions can also be developed using the unsteady-state concept. The Proceedings communicate recent progress in these areas of research and promote future development. The aims are to establish relations between academia, industry, engineers and scientists from all over the world, to stimulate new catalytic technologies as well as fundamental research, and to create new concepts for the development of effective catalytic systems. 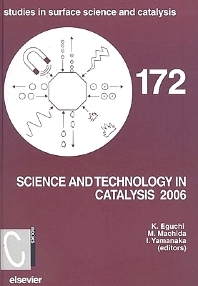 It presents the most up-to-date research in catalysis.